ENO Lounger DL Chair. The Lounger DL is your ticket to serious relaxation. 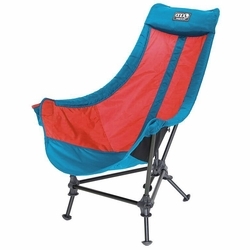 Its effortless shock-corded assembly makes this lightweight chair perfect for the quad, your favorite festival or around the campfire. Equipped with two adjustable leg heights, a cup holder, two cargo pockets and an integrated pillow, the Lounger DL is the most versatile and nap-worthy chair on the market. Eagles Nest Outfitters. Folded dimensions	(Dia x L) 6" x 18"
Adjustable Leg Height	10" and 3"